The Brazilian Grand Prix is a Formula One championship race which occurs at the Autódromo José Carlos Pace in Interlagos, a district in the city of São Paulo, Brazil. The first Brazilian Grand Prix was first held at Interlagos in 1972. It was not part of the Formula One World Championship. The race in 1973 was the first one included in the official calendar. In 1978 the Brazilian Grand Prix moved to Jacarepaguá in Rio de Janeiro. For 1979 and 1980 the race returning to Interlagos. In 1981 the race returned to Jacarepaguá. 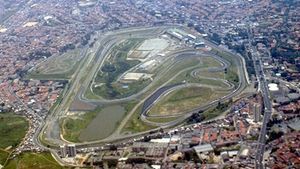 Since 1990, the Grand Prix has been run at Interlagos. A map of all the locations of the Brazilian Grand Prix. Brazilian Grand Prix Facts for Kids. Kiddle Encyclopedia.